A husky-voiced charmer, trained as a ballet dancer and on stage from 1935, she played the malicious child in the London production of The Children's Hour (1936) and first appeared in film as the hero's motherless daughter in South Riding (d. Victor Saville, 1938). Her screen career blossomed in the '40s and '50s, from the time she played her real-life father Mervyn Johns ' daughter in the wartime fantasy, The Halfway House (d. Basil Dearden, 1944). A fetching Mabel Chiltern in An Ideal Husband (d. Alexander Korda, 1947), she became a fully-fledged star as the mermaid, Miranda (d. Ken Annakin, 1948), reprising the role in Mad About Men (d. Ralph Thomas, 1954), and played 20 leading parts in '50s comedies ( Josephine and Men , d. Roy Boulting, 1955), dramas ( Personal Affair , d. Anthony Pélissier, 1953, as a schoolgirl obsessed with a married teacher; The Weak and the Wicked , d. J.Lee Thompson, 1953, as a middle-class girl in gaol for gambling fraud); costume romances (Disney's The Sword and the Rose , 1953, as Mary Tudor; The Seekers , 1954, both d. Ken Annakin); and the wartime comedy-adventure, Appointment with Venus (d. Ralph Thomas, 1951). In truth, popular as she was, she sometimes seemed imprisoned by a too-cute persona. Her Hollywood career, effectively begun with her role as the stewardess in No Highway (UK/US, d. Henry Koster, 1951) for Fox-British , gave her limited opportunities, best remembered of which is that of suffragette Mrs Banks in Mary Poppins (US, d. Robert Stevenson, 1964). However, she has stayed the course and now plays grandmas in films like Superstar (US/Canada, d. Bruce McCulloch, 1999). 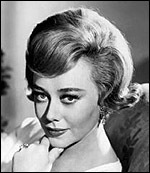 Nominated for a Supporting Actress Oscar for The Sundowners (US/Australia, d. Fred Zinnemann, 1960), she won a Tony for her stage lead in A Little Night Music (1973). Her first husband (of 4) was Anthony Forwood , by whom she had a son, Gareth Forwood ( b .London, 1945), who appeared in several films, including Gandhi (UK/India, d. Richard Attenborough, 1982), and she had a well-publicised engagement to producer Antony Darnborough .